Please note that you are viewing an archived issue of The Cleanzine. New and updated vacancies are advertised in Cleanzine every week. Check out the latest opportunities by clicking the link above. Advertise your current vacancy with Cleanzine and we'll give you the best deal in the industry with same day upload so you can fill the position faster. It goes without saying that food manufacturers and processors at all levels need to ensure the protection of the products they make from contamination. To do this, regular monitoring needs to be carried out to check for food spoilage microorganisms and food poisoning pathogens. Christeyns Food Hygiene, a specialist in food and beverage hygiene, has recently entered a sole distribution partnership for a brand new and unique hygiene verification tool - FreshCheck. Effective on both airborne and surface pathogens, airPHX technology provides continuous infection control for the healthcare industry and is said to offer a cost-effective alternative to existing infection control protocols. Using a proprietary application of atmospheric cold plasma, airPHX is both scalable and affordable, and has been proven effective on 30 common HAI pathogens including bacteria, viruses and protozoa. The manufacturer has confirmed successful results from deployment of its patented non-thermal plasma technology in two live hospital environments. Dr Bernie Lorenz, PhD, chief science officer at ProKure Solutions in Phoenix, Arizona, US, is leading the effort as a technical contact for a new ASTM International Standard that may revolutionise cleaning and disinfecting protocols for indoor and greenhouse cannabis cultivation facilities. How do you track performance when you have multiple cleaning machines in different locations? What systems can you put in place to monitor the equipment, optimise performance and minimise cost? Fortunately, technology is available; it is tried, tested and will provide the transparency you need 24/7 to lower the total cost of cleaning and improve profitability. Say goodbye to greasy grills and odorous ovens with the help of Bio Productions' new Neutral Oven Cleaner, which offers a non-corrosive and non-caustic solution to even the most stubborn grime and comes without the usual nasty odours one might expect when using a hard-hitting oven degreaser. "Oven-cleaning might not be the most glamorous job but it is one of the most crucial," says managing director, Angela Gill. "It is especially important to get it right when it comes to cleaning with chemicals in food preparation areas, and we're confident that our Neutral Oven Cleaner is up to the challenge." Available in both mains and battery versions, the TSM Grande Brio 35 walk-behind compact scrubber dryer has the option of being fitted with the innovative, autonomous Ecoray system, which uses ultraviolet energy to tackle any microorganisms left behind after cleaning. ISS and Vattenfall have entered into one of Sweden's and the Nordic countries' largest agreements for facilities management services, a flexible outcome-based partnership designed to deliver on the parties' mutually developed vision and objectives. The Cleaning Industry Research Institute tells us that the theme of its 2019 Science Symposium, 'Understanding Effective Cleaning', was adopted as the topic last month at a combined meeting of CIRI executive committee and Science Advisory Council members. SAC chair, Steven Spivak, Ph.D., is spearheading the selection of the symposium's technical agenda. "This theme reflects CIRI's core competency," he says. "Methods, measurement and management are critical elements required for effective cleaning, including disaster restoration. Those attending the 2019 symposium will gain a new and deeper understanding of these concepts that collectively define effective cleaning and restoration. With a flurry of news reports about germs in airports and hotels, travellers are more concerned about cleanliness than ever so it follows that businesses need to become more aware of their responsibilities too. NanoTouch Materials' new self-cleaning surfaces address these concerns and particularly so its new launch - a self-cleaning film for touch screens that can turn any airport check-in kiosk or in-flight screen into a continuously self-cleaning surface. HealthSpace Data Systems and Visionstate have agreed to utilise HealthSpace's current suite of mobile audit applications and extend them for use within the facilities management space. Visionstate's product suite includes Internet of Things devices that help track cleaning, maintenance and supply utilisation. Its WANDA device is installed in both public and private facilities such as hospitals, airports, shopping centres, arenas and office buildings. Fatbergs have been in the news again lately with a 64-metre growth having been discovered just after Christmas in the sewers serving Sidmouth in Devon. My links with the bathroom manufacturing industry have led to some interesting debates about the various causes of these disgusting blockages and as well as the obvious culprits, such as careless householders and businesses emptying fats, oils and food debris into the sink and flushing wet wipes down the toilet, questions have been asked about the design of sinks, toilets and flushing systems as well as everyone's drive to create products which use less water, which means that often, less of what we're attempting to flush away, is dealt with efficiently. Clearly we need to continue to cut the volume of water we use wherever possible and I'm surprised that I see so little of systems which use greywater. Basins that empty into the toilet cistern, which I used to see a decade ago and thought were a wonderful idea, don't seem to have caught on as I expected them to. Likewise I can recall writing with enthusiasm about a shower that used filtered, recycled water but have never learnt of any that have actually been installed and I wonder whether the likely cost of acquiring and fitting such new technology, has deterred us from pursuing this solution to conserving our precious water supplies. I also wonder whether we're doing enough to educate people about taking care with the disposal of fats and oils, and warning that even if the wet wipe box says the wipes can be flushed, it's more sensible not to do so? Are people being made sufficiently aware of the benefits of fat traps to keep their pipework free flowing? Finally, the Domestic Cleaning Alliance's Stephen Munton wrote in response to last week's leader: "I used to get sent to clean an office periodically that was never cleaned from one month to the next between my visits. I loathed going there and the toilets were something else. They made the washroom from Cagney & Lacey look like something from House & Garden. I have no idea how the staff could work there." Who said cleaning was an easy job to do? To ensure that the UK will continue to be able to monitor and evaluate chemicals to reduce the risk posed to human health and the environment if the UK leaves the EU without a deal on 29th March, the Department for Environment, Food & Rural Affairs has issued a reminder of the actions those involved in the chemicals business may need to take. In the event of no deal, the UK REACH (Registration, Evaluation, Authorisation & Restriction of Chemicals), will replace EU REACH Regulation and will be brought into UK law by the European Union (Withdrawal) Act 2018. RB, (formerly known as Reckitt Benckiser) and Diversey have this week announced a strategic alliance in the North American industrial and institutional cleaning market. The expanded partnership builds on RB's strength in convenient, ready-to-use solutions-via brands including Lysol, Airwick, Easy-Off and Resolve-and Diversey's advanced institutional cleaning expertise in hospitals, schools, and office complexes across the country. * Syed Ahmed (pictured), CEO, Savortex will discuss the Internet of Things and how it can benefit the cleaning industry. Syed will show how IoT can help identify the hidden risks in buildings that humans can't - in terms of energy, waste and resources. Interclean Istanbul will welcome an exclusive first to its exhibition halls when the show opens on 10th April - the Healthcare Cleaning Forum MENA Regional Program. An exciting addition to this year's edition of the region's leading professional cleaning and hygiene event, the forum will bring together top experts and professionals from the healthcare sector to explore the key challenges facing healthcare cleaning. The cleaning accessories offer from Prochem Europe has been expanded with the introduction of the Powermate 1200 extraction power wand - and feedback from the marketplace has been unequivocal. Domestic cleaners report that it makes cleaning house carpets quicker; contractors like the way it breaks more down soil than basic wanding would and improves productivity; housekeeping teams appreciate its light weight and ease of use around beds, desks and other hard-to-reach areas. Steam cleaning is an economical and environmentally-friendly process for the safe and effective cleaning of a number of different surfaces. The new ThermaSteam trailer-mounted industrial steam cleaner from Morclean, is a revolutionary, heavy-duty cleaning system built to effortlessly remove graffiti and chewing gum without the use of harmful solvents or chemicals. The machine will also remove, paint, oil, grease, wax coatings and bitumen, as well as withstand hard work and regular use. 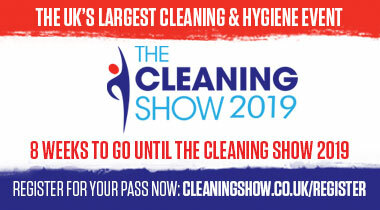 WhiffAway Group, a world leader in waterless urinal technology, will be exhibiting at The Cleaning Show at London's ExCel from 19th to 21st March 2019 on stand number F12. WhiffAway's fully recyclable Waterless Urinal System removes the need for customers to change urinal fixtures to go waterless and results in significant savings in energy and water consumption - and money - as well as eliminating urinal odours. Alongside its own global washroom brands, WhiffAway also contract manufactures bespoke solutions for many OEM, merchant and hygiene companies. Hawaii Wildlife Fund, with the help of countless volunteers, has been cleaning Hawaii's coastlines for 15 years and just reached a milestone of recovering 500,000 pounds of plastic, including bundles of nets and line. Its efforts have been frustrated by an abundance of microplastic debris which is the most difficult to collect and remove from the beach because it takes so much time. 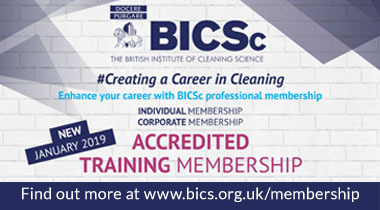 The Institute of Inspection, Cleaning & Restoration Certification has this week announced Brandon Burton as its new standards chairman, taking over from longstanding standards chairman Howard Wolf on 1st January 2019. "I'm excited to take on this new role within the IICRC," says Brandon. "Howie left some big shoes to fill, but I'm eager to begin this next chapter, and further develop the IICRC Standards program." DuPont Industrial Biosciences officially broke ground this week on its new site at the Leiden Bio Science Park in Oegstgeest, the Netherlands. The state-of-the-art, multidisciplinary facility will utilise modern biotechnology to make industrial processes more efficient and products more sustainable. The bio-based solutions created will have a direct impact on some of the most pressing societal issues of today: reducing food waste; reducing the environmental impacts of livestock farming and improving animal health; producing renewable fuels; and lowering environmental impacts in the textile and laundry industries. We keep an extensive archive of news stories and product information that have featured in past issues of The Cleanzine. If you would like to run a search of the The Cleanzine web site using the search tool below please just go ahead by entering in the name of the person, product or company or any other key words that you are looking for. The Cleanzine is broadcast every Thursday. You may receive it FREE each week by clicking the link above. To prevent this newsletter from getting swept up by overzealous email filters, we suggest that you add news@thecleanzine.com to your address book. Our weekly updated Hospital Hygiene features current developments and product solutions cleaning and hygiene industry manufacturers are coming up with. Read More. The fight against fatbergs received a major boost this weerk with the publication of a new official standard identifying which wet wipes can be flushed down toilets safely. Manufacturers of wipes will be able to feature an official water industry 'Fine to Flush' symbol on their packaging if they pass strict scientific tests. One of the UK's largest public swimming pools is to be cleaned using Prochem-supplied scrubber dryer technology. The opening of a new leisure centre in Morden Park, Surrey, sees in a major upgrading of wet area floor management geared to improving cleaning outcome with decreased user downtime. Terry 'Turbo' Burrows (pictured), still officially the world's fastest window cleaner after over 20 years, is officially challenging window cleaners from across the globe to try and take his crown at the UK's Cleaning Show expo in London in March. The Cleaning & Hygiene Suppliers Association's analysis of the 2018 performance of its Accreditation Schemes shows exceptional conformance in all areas. The results make it clear; if buyers of cleaning & hygiene products want to be certain that 'what's on the box is what's in the box', they need to look for the CHSA Accreditation Scheme marque. One of the UK's leading manufacturers of professional cleaning and maintenance chemicals is celebrating its 50th birthday in style, after securing substantial business from the aerospace industry for its new impregnated wipe products. Gutters that are filled with leaves, grass and other debris quickly become blocked and lead to internal building damp and mould problems - or even worse, irreparable damage to the property and stock which in turn could lead to higher insurance premiums. A leading authority for asbestos training provision in the UK, the UK Asbestos Training Association (UKATA), is urging all public sector employees to be asbestos-aware in order to better manage the 'ticking time-bomb' in thousands of public buildings.